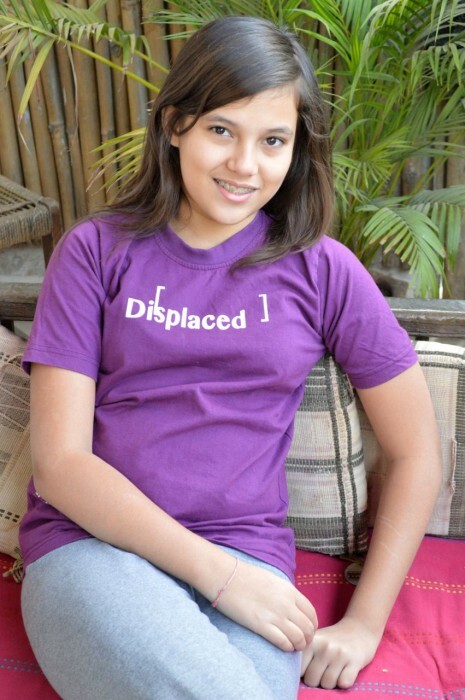 Tara Chazot loved to tell everybody that she first made her presence known in the days surrounding the Gujarat earthquake and was born just after 9/11, in 2001. Ten days ago, in the shadow of the lost Malaysian aircraft, and the Crimean troubles, she left us. A life bookended by momentous world events of sorrow and pain. But this child, Tara, was the antithesis of that – vibrant, enthusiastic and loving. We knew Tara through the Mahatma Gandhi International School in Gujarat where we ran art and drama projects in 2012 and this year. Her parents founded the school, she was a student and her older sister, Lissa, a teacher. We had the very great pleasure of staying with the family on both visits. We shared a love of cats and she taught me (Anne) how to do stop animation. She spoke three languages, maybe four, and used her voice to articulate her compassion towards others and her views on the environment. She came with her grandmother to see my show (Alex). On the journey home we were astonished by her insights into the stories especially her perception of underlying mental illness in the characters. We remember the lovely times we spent together with the family and school community – all only last month, and an especially lovely evening with Tara and her grandmother, Prem, on our last night in Ahmedabad. She had such a unique, creative, insightful and delightful nature and was growing into a lovely and charming young woman. We feel part of the community, family and friends in grieving the loss of this unique and delightful child. I took these photos of her in the purple on the morning we left, a month before she died of a fever and infection. Her last words to me were “I’ll miss you”. Mine to her were “lots of love”. Nine months after Tara’s death, Alex Pinder and I are back in Ahmedabad, India sharing in the profound grief and bewilderment of her family and school community. Her unexpected death had especially impacted her classmates (now in Grade 8) who felt shocked, grief-stricken and shattered by it. As a studio artist, I have long immersed myself in the realms of trauma, loss and grief. Although for most of that time my own experiences were relatively few, I felt a deep and constant urge to examine and express about the shadowy and unexpressed feelings of trauma, loss and grief, and to open up the space for others to create and speak about the complexity of their feelings. Artists have always been driven to create work in response to grief, to seek meaning, bear witness, shock and commemorate through art. I believe that it is work of the artist to say things about an internal and an external life that must be said, and to do so gently and with dignity. I noticed viewers of my art responding with depths of emotion that suggested the work, and I, were connecting with a part of their humanity that required such work; often this was happening in ways that were unexpected for them and increasingly significant for me. Now, as I too have lost dear friends, I know first hand that the unique qualities of making art brings solace and meaning to loss and grief, and a sense of wellbeing to those who suffer. Anjou Musafir (Tara’s mother and co-principal of the school) invited me to work creatively with the Grade 8s to help them express their feelings of loss and grief. A number of events had already been held in this very nurturing school to grieve and celebrate Tara’s life. 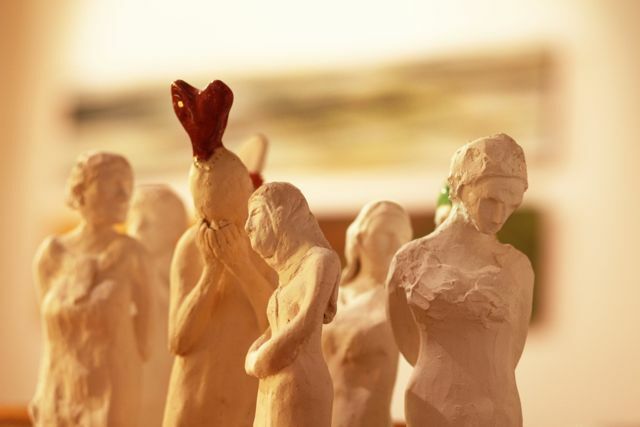 This art project would another step to help students acknowledge and process their feelings. This was the third time I’ve been a guest at the school and although I would not say I know the Grade 8s well, we have a warm relationship upon which to have a creative conversation about Tara’s death. We started our two-session workshop with a discussion about the different emotions and tried to label them appropriately. I wanted to help students identify and understand stages, as well as the nuances, between feeling neutral and feeling a strong emotion. I invited students chose an emotion (eg joy, sadness, surprise, anger); then starting with a neutral pose, the face in stillness, create a clay mask. Step-by-step they changed this neutral face through each stage of that emotion – such as to irritation, annoyance, and crankiness towards anger, from interested, curious to surprise. I encouraged them to notice how the cheeks rise, the eyes open or crinkle up, the lips tightens, or the mouth opens, as they move through and create each step. Ahmedabad, like all Indian cities, is incredibly noisy; traffic is constant, horns are blasting, people speak very loudly, and students seem to talk non-stop. It can be a difficult environment in which to create. I asked students to be as quiet as possible as they made their masks so that they could immerse themselves in the work, feel and see how the face holds the emotion, then put that into their artwork. They are a terrific group of young people, quite used to this request from me now and easily able to settle into focussed making. We took photos of the masks and the student’s face as they transitioned through each stage of the project. We sat in a circle together a few days later. I asked for their reflections on the previous session: “We could feel the emotions” and “notice how the face changes”. “It was relaxing”. Clay, it seems, is always relaxing. Tara’s death has left a pall over the school and her class; I suggested it might be helpful to build on our exploration of emotions, to express something about how each of the students in her class feels about her death – how had it impacted them? what did they feel? When I asked if anyone wanted to share their feelings, no-one spoke. Finding the right words can be hard. I recalled to the class that Alex and I had been here at the school only a month before Tara died and remembered the art project the class and I had worked on together during that visit. We had only just arrived back in Australia when Tara died and were shocked and upset to hear about what happened. We greatly felt the distance between India and Australia as we had no-one with whom we could share our feelings and confusion. I told them about my work on grief and loss and the 60 statues I had made over the years to express grief, and how in their sadness some also conveyed the happy memories and thoughts. I wanted students to know that feelings of grief are complex and often in a state of flux; that they will not all feel the same depth of loss, and some may feel lost, depressed, sad, angry, upset, and that feelings are neither constant nor permanent. Would they each like to make a statue to express how they are feeling about the loss of their classmate? Yes, was their response. Throughout the morning students created thoughtfully and quietly. As the work emerged students confronted the sometimes unnamed and unspoken sensations that had permeated their minds and lives without clarity, understanding or resolution. They took on the pose of their statue so they could see and feel the emotion in the body. Step by step they developed their ideas, their feelings, their expression and put all this into their artwork. It took hours. We had a break and returned to the work to add finishing touches, to carve and smooth and bring to the work all that they would like to include in it. When everyone had finished, we arranged their art on a clean table to honour their work. The emptiness in my stomach. Lying on the bed, not knowing what to do. The two sessions allowed us to delve into our feelings on the untimely and sudden death of this young, vibrant and much loved child and express them through art. Artist Mona Hatoum speaks about our capacity to understand and respond to human experiences on both a cognitive, or “known” level, as well as on a felt or “unknown” level, that is, we think and we feel. Art works in this same way, expressing thought and feeling. It offers sanctuary from the frustrations of trying to find expression or meaning in a verbal language that is unsympathetic or unavailable to the delicate purposes being asked of it. The functioning of art on the two levels of thought and feeling suggest why creativity is such a useful counterweight to loss. 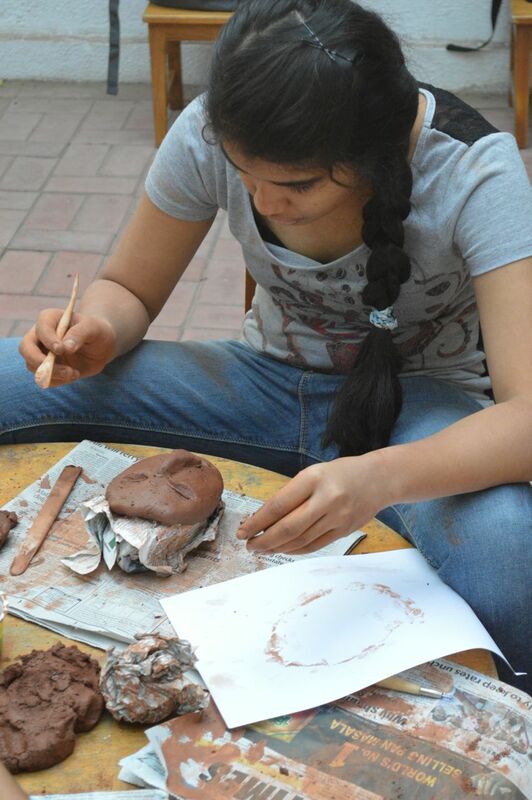 The immersion into art, including the calming and soothing nature of working with the clay, helped students access and bring precision to the nebulous emotions that are always part of the experience of the death of a friend. Many remembered her as the first person to welcome them into the school when they were new. Some students had many tales and memories to share. The Grade 8 students told me that the process had been helpful and many came up to thank me for the workshop.